It works on birds as well as humans and their pets: give them food and they will come. Birds eat either plants—in the form of seeds, berries, fruit, nuts, or nectar—or protein, such as insects, worms, larvae. Find out the food preferences of the birds you want to attract, and offer it to them. Bird feeders are the quickest method for attracting birds. For seeds, you have the option of tube feeders, hopper feeders, birdseed ornaments, platform feeders, and window feeders. Mixes of seeds, nuts, and dried fruits are formulated to attract specific species. Black-oil sunflower attracts a wide variety of species, including nuthatches, sparrows, cardinals, blue jays, chickadees, and finches. Nyjer or thistle seed requires a special feeder to hold its tiny seeds and attracts goldfinches. You may also hang cages to hold suet. This lard packed with various ingredients attracts insect-eating birds such as woodpeckers, nuthatches, and jays. Hummingbirds come to feeders filled with nectar, also known as sugar water. 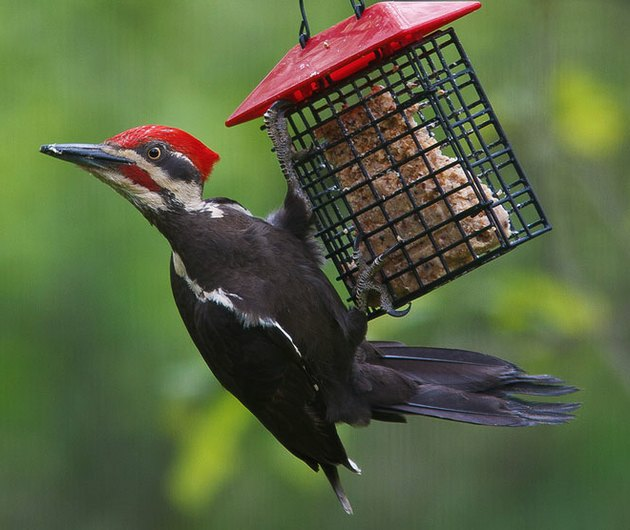 Hang feeders near a tree or shrub that birds can use as a staging area. They'll rest there, checking out the scene to make sure all is safe, then sweep in to quickly grab a nibble before retreating back to a safe place. Some bird species are okay with crowds, but others aren't, so put out several feeders in different areas to attract more birds. Besides feeders, use your landscaping to feed your feathered friends. You can plant seed-bearing flowers as well as bushes and trees that bear fruit and berries to attract birds. Mix them up so you have blooms, seeds, and fruit maturing at different times of the year to bring in birds year-round. Choose a few trees that retain their fruit into the winter months, for birds that are migrating, as well as for year-round residents. Vegetation, by the way, also serves as a habitat for caterpillars and other bugs, in turn attracting the birds that eat insects. Plant cardinal flowers and columbine; the nectar attracts hummingbirds. Trumpet honeysuckle also attracts hummingbirds, and purple warblers and hermit thrushes eat its berries while Baltimore orioles eat the flowers. 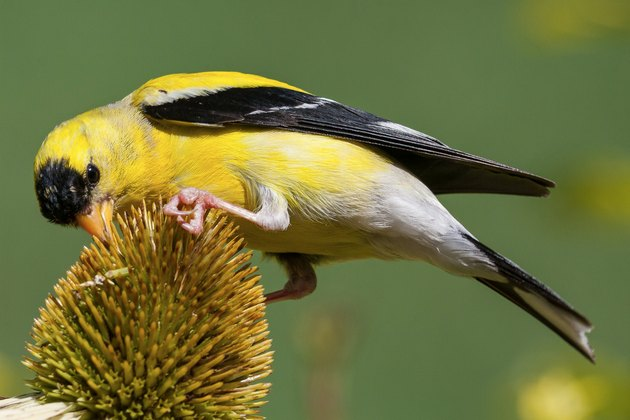 Goldfinches and other birds use the downy part of milkweed seed to line their nests. The nectar in bee balm and salvia attracts hummingbirds and butterflies during the summer, and provides seeds later in the season. Birds gorge on summer fruits—blackberries, raspberries, elderberries, mulberries, serviceberries, and pokeberries—as they forage. The National Wildlife Federation advises growing plants native to your area. These plants are not only better adapted to your region—making them more likely to flourish—they'll provide the most appropriate nourishment for the birds in your area. In autumn, avians prepare for winter and the hard days of early spring, and migratory species charge up their energy before heading south. Autumn fruits usually come from summer-flowering plants like sumac, chokeberry, and dogwood. Sunflowers are bird magnets. Cardinals, titmice, and bluebirds all feast on the fleshy fruit of flowering dogwood, red osier dogwood, and gray dogwood. Eastern red cedar bears fruit in the fall, but they persist into the winter months to attract waxwings. In the late summer and fall, goldfinches crowd to the enormous seedpods on coneflowers, so don't cut them when the petals wilt. In the winter, birds will scratch on the ground beneath looking for seeds, too. Wild grape, Virginia creeper (mockingbirds, blue jays, nuthatches, and woodpeckers love the fruit), staghorn sumac, and crabapples are other excellent food sources. A goldfinch feasts on a coneflower. Birds get some of their winter meals from persistent fruits, which remain on the plant through the colder season. 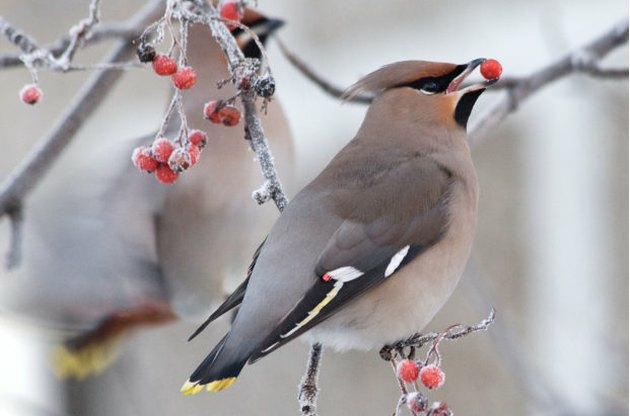 Berry-producing shrubs are also an important source of food for birds during the cold months when other fare is scarce. These serve as shelter and nesting sites during the other seasons, too, and lend your landscape color and visual interest year-round, especially when offering their white, red, purple, or orange fruit. With its spined leaves, for example, holly provides a physical refuge for birds, as well as nourishing bright red berries. Planting a range of deciduous, evergreen, or semi-evergreen shrubs and trees—including red-osier dogwood, staghorn sumac, American cranberrybush viburnum, red chokeberry, beautyberry, blue spruce, hawthorn, winterberry, or bittersweet—will attract birds like cardinals and waxwings. 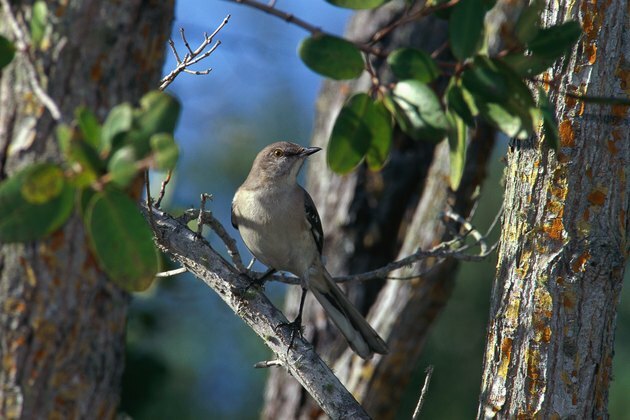 With the right shrubs, your wintertime yard will fill with the happy chatter of birds. A waxwing eating winter berries. Leave a few small piles of leaf litter on the ground, raking some of them under shrubs to create mulch. Why? Some species never eat at feeders, but instead scratch on the ground. Birds such as robins and towhees snack on the small bugs and grubs that tend to hide under decomposing plant matter. A brush pile out of the way can serve as a place to hide. Birds need dense foliage and branches to take cover from predators. Landscape design can play a big role in attracting birds. An empty lawn gives them nowhere to hide. So provide them with low-lying shrubs, bushes, trees, and brush piles that they can shelter in between forays for food, and they're more likely to stick around. On hot summer afternoons, birds congregate to the shade given by maples, oaks, tulip poplars, aspen, and sycamores. Although not all birds use birdhouses or roost boxes, many do, including bluebirds, wrens, titmice, and chickadees. (Birdhouses are for raising families, while roost boxes give groups of birds a communal shelter from freezing temperatures.) Choose natural color shades such as brown and dark green so the house blends into the environment, and make sure the structure has ventilation holes in the top to allow air to circulate and keep temperatures inside down. Make sure the opening is the right size for the species you want to attract—too large and it could let predators in or allow other species to take over the premises—and that it faces away from prevailing winds and direct sunlight; southward is usually best. Place the house a safe distance from the ground and surrounding branches to make it harder for predators such as snakes, raccoons, rats, and cats to gain access, and clear the area nearby of places where predators can hide. 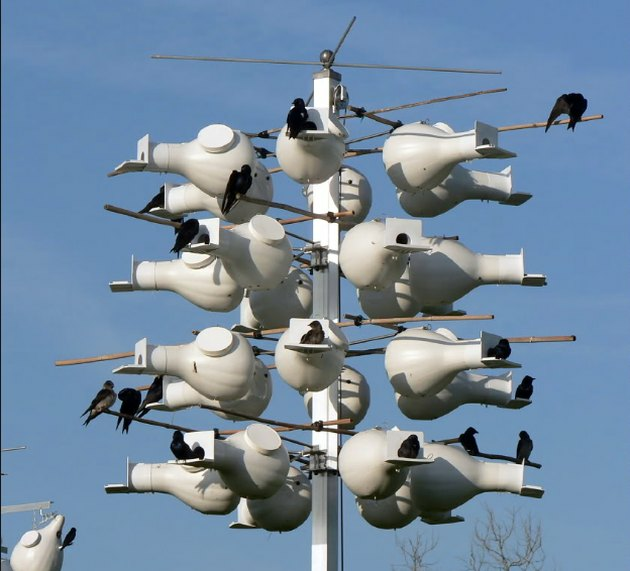 Birdhouses made from gourds attract purple martins, which help keep mosquito populations in check. Only cavity-nesting birds such as chickadees, titmice, wrens, bluebirds, woodpeckers, nuthatches, and some flycatchers will use bird nest boxes (or birdhouses), because these species are adapted to nest in enclosed areas and the nest boxes emulate a natural cavity. Get a nest box with entrance hole and interior in dimensions preferred by the birds that visit your yard. For non-cavity nesting birds, shelter comes in all forms, from tall grass, brush, hedges and shrubs to trees. Birds may avail themselves of mailboxes, door wreaths, and hanging baskets. As long as you have vegetation in different types, shapes, and sizes, you'll attract nesting birds—and the more cover, the more nesting birds. Birds need fresh, clean water to drink and bathe in. Although commercial birdbaths are sold with pedestals, birds actually prefer shallow water that's at ground level, where they would find it in nature, so leave the birdbath on the ground in a shady spot—to keep the water cool—or consider putting in a pond, water garden, or fountain. Alert your feathered friends to the presence of water by attaching a mister or dripper to the birdbath; it will cause the water to gurgle and glint in the sunlight and catch the birds' attention. If the water isn't shallow—think knee-height on a bird—birds won't go in, but you can place flat stones in it to raise the height of the bottom. Make sure to keep a wide swath around the birdbath free of tall grasses or shrubs that predators can hide in—10 to 12 feet of clear space will allow birds to spot a stalking cat and fly to safety. Birds need water in the winter, too. You can keep your birdbath from freezing over by placing a temperature-controlled water heater in it. Submerged in your birdbath, it automatically turns on when the water reaches 35°F. 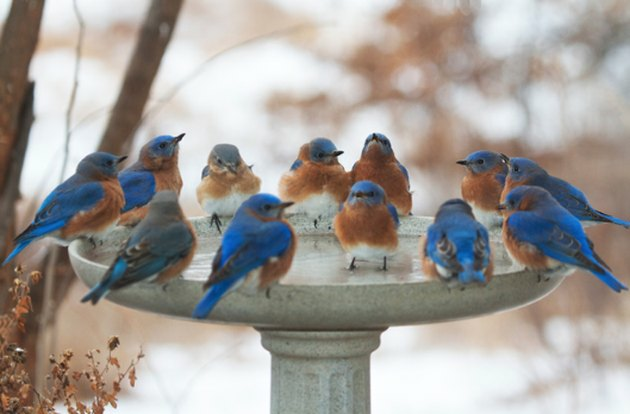 The truly fanatical bird lover can invest in a birdbath with a heated base. Housecats decimate bird populations. If you can't keep them inside, at least make sure to set up feeders and birdbaths in open expanses where cats can't hide, so birds will spot them and fly away before your ferocious feline can catch them.